I teach trampoline. Let me stop you right away from imagining teenage phenoms flipping and twisting in the rafters, a bounce away from their Olympic aspirations. That’s rarely the situation where I work. Instead, think adults of every age, size and ability, many of whom haven’t had a bounce on a trampoline since they were children, if ever. Some are looking for a new way to stay or get fit, some want to see if they “can still do it,” some are there to try something they have never done before. They are curious, expectant, giddy, eager. Some are also scared. As their symptoms suggest, they are universally certain bouncing will be fun. And no matter what skills they are able to achieve in class, they leave exhilarated, proud, smiling from ear to ear. I recently came across an old Canadian trampoline instructors’ manual and the first sentence says “Children discover the joy of rebounding at a very young age.” And we all do. Whether we first tried it on a bed, a couch or even a trampoline, there is an undeniable feeling of unbridled joy when we bounce. In teaching adults, I can confirm they experience this joy too. So if children discover it at a very young age, and still enjoy it throughout adulthood, why don’t we bounce more? When along the road to becoming adults do we start to think the joy of play is only for kids? If joy is not enough of a benefit for you, trampoline has some amazing side-effects that blow it out-of-the-water as one of the best ways to exercise. If you’ve ever trampolined, two benefits are obvious. It’s a great cardio workout and it’s kind to the joints. In trampoline, unlike running, the forces on your body are distributed evenly with no undue pressure on the feet, knees, ankles or lower back. The springs also aid in absorbing force that, in ground-based activities, would otherwise be placed directly onto your joints, muscles, tendons and bones. NASA found rebounding to be “the most effective, efficient form of exercise yet devised” in a study conducted back in the 80s. There are some amazing findings, many very technical (you can find the study here http://jap.physiology.org/content/49/5/881). The study found that rebounding can help strengthen every cell in your body, largely due to changes in gravity and pressure and more oxygen reaching them. Another cool finding is that bouncing improves circulation of the lymphatic system. The lymphatic system can get backed up which can lead to all kinds of illness. The idea is there’s an osmotic effect on the lymphatic system from bouncing which incites its circulation, enabling it to eliminate toxins, directly boosting the immune system. In a nutshell, trampoline develops strength and muscle-tone, is excellent cardio fitness, efficiently working the heart, circulatory and respiratory systems, improves balance and coordination and even helps clear the lymphatic system and increases white blood cell activity, boosting the immunes system and helping to strengthen every cell in the body. Wow. Those are the benefits of trampoline to the body but it also benefits the mind. The act of trampolining, of bouncing and performing skills, takes focus and coordination, determination and commitment. You can bounce on the trampoline on your feet, your seat, your back or your front, so there are endless ways to move about from one position to another. To learn a single trick, to add it to a series of tricks, to remember and perform a new routine – these are all skill-building tasks and it’s our brains doing the heavy lifting. With practice trampoline can build balance and coordination and greatly improve overall physical awareness and control. A trampoline is like a merit-based toss system – the better you hit it, the better it will toss you. If your body is tight, engaged and in the correct position when it meets the trampoline, the bounce you get in return will be smooth, even and high. It can be hard to keep your cool, and your body tight, while learning new tricks. Building skill here can lead to amazing new shades of physical control. Every trick acquired along the way is a victory — and a building block. Video selfie on a trampolineIt doesn’t matter if you’ve never bounced, if you weren’t a gymnast, if you’re not fit, if you perceive yourself as uncoordinated. There is no too old and no too young to bounce. I have students who are police officers, moms, scientists, kindergarteners. The secret to learning trampoline is progressions. We start from the very beginning and we build. You don’t just come in and start chucking backflips. Let’s be real. Trampoline can be dangerous if not done sensibly with the proper supervision, and the trampoline I teach on is super-bouncy (quite unlike the backyard variety), so the first thing I teach is how to stop bouncing. Is that putting the cart before the horse, the chicken before the egg, the 1 before the 0? Nope. It’s the first step. It’s probably true (maybe) that trampoline isn’t for everyone but it’s got some amazing things going for it that elevate the body, and the mind and soul. For me, I bounce because it’s fun. And because I love figuring out how to do new tricks. I am the queen of “one more time.” Just like many kinds of play, it is a side-effect that it keeps me fit, and is such phenomenal exercise. There are so many ways to exercise and I hate to see people who think of it as chore, something they must do for their body that their mind is not stimulated by. Find what feels like play to you and go for it. In terms of heart rate, oxygen usage, and biomechanical efficiency, the NASA study found ten minutes of trampoline is equivalent to thirty minutes running. For me, that choice is easy. My playground is a trampoline. What’s yours? Hope Hackett regularly defies gravity. 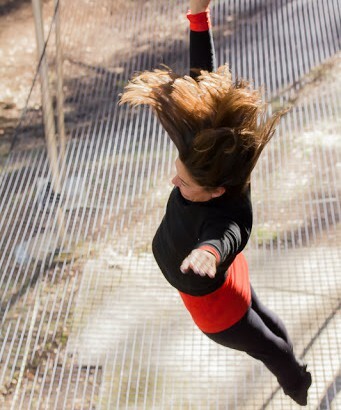 She teaches flying trapeze, trampoline, and tumbling.